Perfectly Created Chaos! : More Embossing "For You"
Well, my embossing craze is continuing. I swear, it's like discovering a technique for the first time. It's amazing how you can be reinvigorated just by getting inspiration from other people. Once again I found mine with Jenn McGuire. I wanted to try her emboss resist on pattern paper technique. Now, I really really like this technique; but I can tell it's one that I need to practice a bit more because the key to this particular technique is finding the right pattern paper and ink combination. As you can see from my sample, it's very hard to see the pattern paper within my embossed sample. I stamped the image from SU's "Fresh Cuts" set on a piece of polka dotted pattern paper from Paper Studios "Mirabelle" collection. Then I embossed it with Clear embossing powder. I used my blending tool to apply some Antique Linen, and Vintage Photo distress ink. Finally, I took just a bit of "Fired Brick" distress ink and went over the image as well, to try to bring out a bit of the red that is in floral pattern paper in the background. Embossing is a great technique; but it does take a bit of practice and patience and that part in an of itself makes it very fun to do! Ok, so quite a few challenges from Thursday and Friday for this card. 2. AiFactory: Use your favorite embellishments: mine are buttons and flowers. Use them every chance I get! Pretty card! Thanks for playing with us at 4 Crafty Chicks! Beautiful card, thanks for joining us for our anything goes challenge at Bling It On. Lovely card! Thanks for entering the Art Impressions challenge. Have a wonderful day! 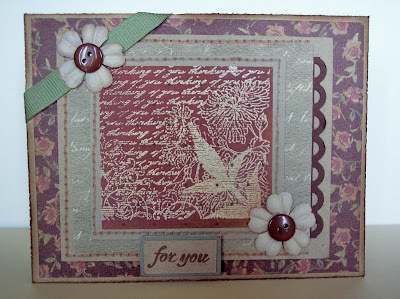 I just love embossing any kind really and yours looks fabby! Loving where you put the stitching on your beautiful card. thank you so much for sharing it with us at 4 Crafty Chicks.